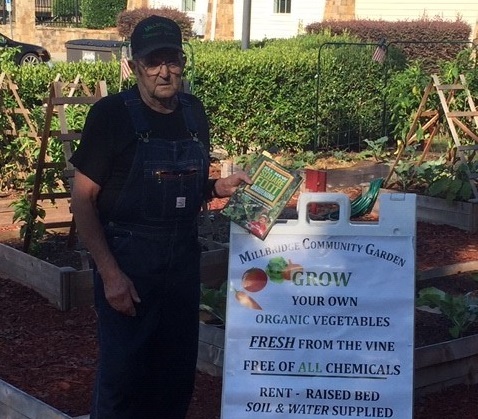 October is gardening month here at MillBridge, so who better to speak with then our very own community garden organizer, Malcolm Cowles. He’s holding a special meeting at the community garden for all that are interested on Saturday, October 20th at 11 a.m. RSVP to him at marinemal37@hotmail.com. Q: Tell us about yourself, Malcolm! A: My wife Suzanne and I have lived in MillBridge for five years. I’m originally from Syracuse, New York where I grew up on a dairy farm. Before retiring, I worked on the high steel as an iron worker. I’m 81 years old and enjoy our community garden very much. Q: We have a community garden? Just kidding! Tell us more in case some of your neighbors don’t know about it. A: We started the community garden about two years ago. It’s located by just past the fitness center. We have twelve 8ft x 4ft raised beds currently being rented and we have room for at least 30 more! It’s $100 per year, which gets you exclusive access to your plot, including the soil and wood frame. Q: What kind of things do you grow? A: Depends on the season. Given the size, they’re great for fresh vegetables like tomatoes, green peppers, hot peppers, brussel sprouts and carrots. Right now (Fall) is a great time to plant cauliflower, broccoli, radish, peas and more. Eventually we want to grow on the hill next to the existing garden. It would be terraced, and we could focus on larger crops like pumpkin, squash and corn. Q: How did you get into gardening? A: It brings me back to my dairy farm days! I love getting outdoors and feeling the sun on my back. It’s so gratifying to see things grow, not so different from watching children grow. It takes nourishment, time and attention. Mother nature is amazing! Q: How often do you get together with your group? A: We have weekly gatherings at the garden on Wednesday at 6:30 p.m. In addition to gardening we like to chat and hang out too. Anyone is welcome, even if you don’t rent a garden. Bring your kids out too! I think all children should learn how to be self-sufficient. A: We are all organic! No pesticides here. Please do come out and join me on Saturday, October 20th at 11 a.m. at the garden. Macaroni Kid Guide: Why Buy New? It’s All About You!